(ARA) – Starry evenings and backyard entertainment go hand-in-hand. 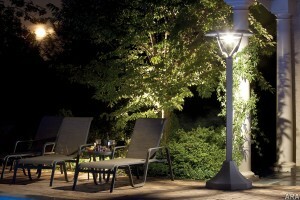 When the sun goes down, the right landscape lighting can turn any backyard into a stylish outdoor living space. With so many options, it’s easy to fill your nights with light to enhance security, decor and entertainment. * Keep your lighting simple. Start with one main lighting source and add accent lighting to highlight garden features. Don’t over-light. It wastes energy, is costly and unappealing. * For illuminating your entryway, deck and patio, use lighting that mimics moonlight, like new solar-powered lighting systems. * Stagger path lights. Be creative. * Skip the complicated wiring and costly electric bills by using new solar lights. * With energy costs rising, people are looking for ways to cut costs. Decorative lights illuminate specific areas but draw on energy, have wires that need to be hidden and need replacement bulbs. Twenty-first-century solutions – like solar energy – harness the power of the sun to illuminate the night. “Now everyone can get in on the solar revolution,” says Marc Jensen, marketing director for Byron Originals, Inc., makers of the new SunLight 180 System. The latest high tech solar-powered outdoor lighting appliances come in styling that’s durable and low-maintenance. They harness the sun’s power by day, and when provided with enough light energy from the sun, last throughout the night. “SunLight 180 delivers warm white light equivalent to a 40-watt incandescent bulb, packaged in a sleek design,” says Jensen. “Plus consumers can save on costly energy bills with the low-voltage, high-efficiency LED fixture that requires no electrician or special wiring.” For more information, visit www.Sunlight180.com. So whether you want hours of lighting for your entryways or for evening outdoor entertainment, look to the sun to light up your nights.